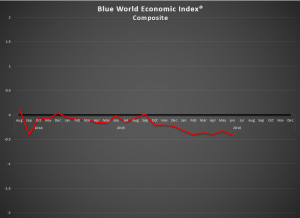 According to the Blue World Economic Index®, June 2016 was NOT a good month for the economy. The index slipped from -.32 to -.41 and not only were the monthly readings weak, but a quarterly review of the recent and longer term trends yielded some downgrades. With half of 2016 in the books the Index average is materially lower than the average for 2015 running .26 lower at -.37. Seven out of eight major categories were negative this month (welcoming another category to the red ink congregation) with Employment and Manufacturing continuing to be the weakest areas. Real Estate was the only positive category but even it lost ground from May to June 2016. The Consumer category saw an improvement but still could not achieve black ink status. Without the full impact of Brexit or any hint of significant policy change on the horizon, our outlook regarding material improvement to the BWEI® is rather grim. 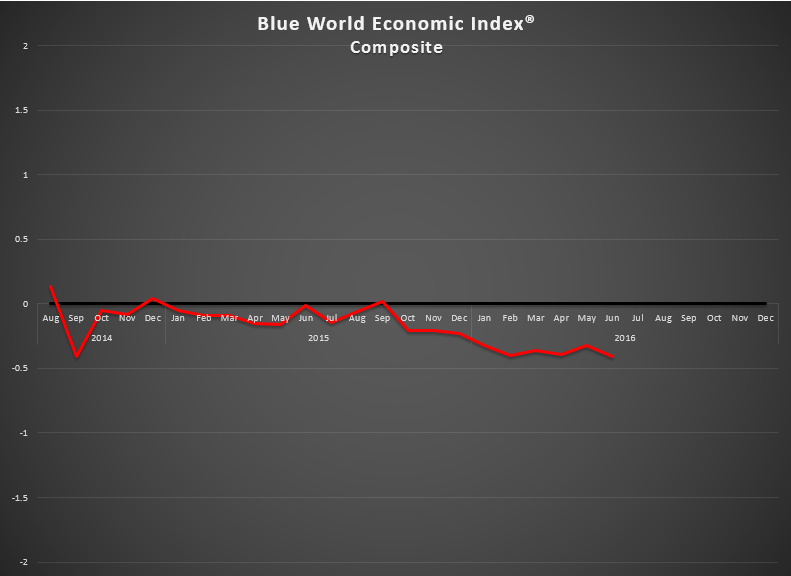 Watch for the Blue World Jobs Report Analysis out next Friday the 8th and Matt will be analyzing it live on CBS Chicago’s Noon Business Hour at 12:09pm central at WBBM AM780 and 105.9FM. When it’s bad it’s bad, and this is bad without a scintilla of positive or even hopeful news. We keep saying “policy matters.” Yesterday our esteemed President spoke of the risk of losing the “progress” we’ve made, so we suppose he feels the majority of us have no interest in returning to the days of three percent plus growth in GDP, a healthy labor market, and men being expected to use the men’s room… He did, after all, see these figures yesterday. The headline is devastating, and the detail is worse. 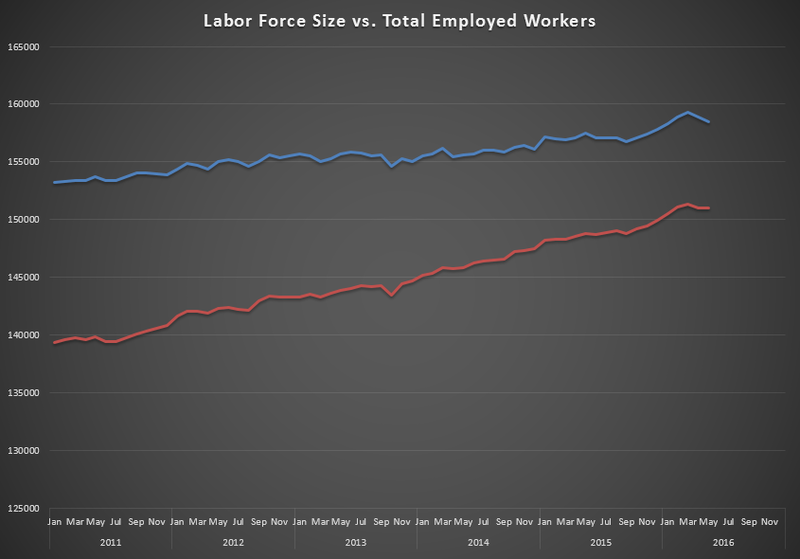 The unemployment rate fell because the labor force shrank in much larger magnitude (-458k) than jobs were added (+38k), thus moving the lines in the above graph closer together, giving us an artificially low unemployment rate as has been the case now for an entire administration. The numbers for the private sector are worse. There were only 25k net hires, and of the 59k in downward revisions to the two prior months 58k came off of the private sector. 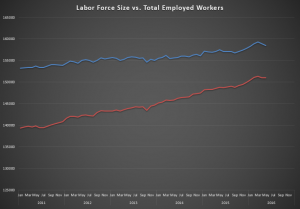 The Participation Rate has erased five months’ worth of gains, The Not in Labor Force total exploded by a breath-stealing 664 thousand, and Part Time for Economic Reasons was up almost a half million. The Blue World Economic Index® remains in negative territory with stunningly impressive correlation to the Fed’s Beige Book, which eliminated any reference to growth as “moderate,” leaving only “modest” to describe what should be the world’s greatest economy. Apologies for the delay. We experienced a connectivity failure yesterday. The numbers recounted below reflect the close of the month of May 2016 with Farm Prices, a component of the Inflation category, being the last to report on 5/31/16 at 2:00pm CDT. 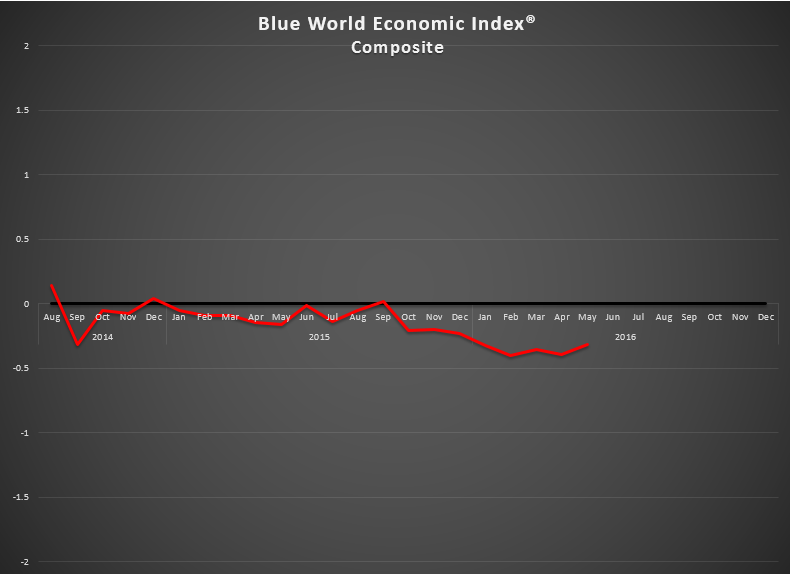 Less negative is the best that can be said for the U.S. economy according to the Blue World Economic Index® for May 2016 which came in at -.32, .07 better than April ‘16’s -.39. Compared to how the month started that is a bit of a relief. Of the eight major categories, six checked in with below zero readings which is one worse than April as Services joined the underwater group. Of the five categories previously in negative territory Employment and Manufacturing deteriorated, General Measures, Inflation, and Retail improved while Real Estate and Consumer Measures padded their plus side showings. That represents a really nice recovery for the Consumer category as the first half of the month did not look good. The biggest concerns are the continued fall in Manufacturing even in energy dependent Fed regions despite increasing oil prices and a drop to negative for Services which had been the cornerstone of strength for the index. Due to the big tallies by Real Estate and Consumers, a record-setting low was happily avoided. We maintain “hope” is not a responsible strategy for managing any business much less the economy but considering the policies in place and those being contemplated we have no choice but to hope those month-saving numbers represent a bounce, not a blip. Don’t miss the Blue World Jobs Report Analysis out this Friday and may your June be a profitable June. We’ll do everything we can to help!